One of the most fun things about our jazz evenings at Kasha Ki Aasha is that the performers are always changing! This Saturday we are welcoming a new 5 piece band, TAKE 5 for two sets of great jazz classics. Emerging musicians love our welcoming audience and the ambiance always goes up a notch because of the incredible energy they bring to their performances. Come join us for what is sure to be an incredible evening! 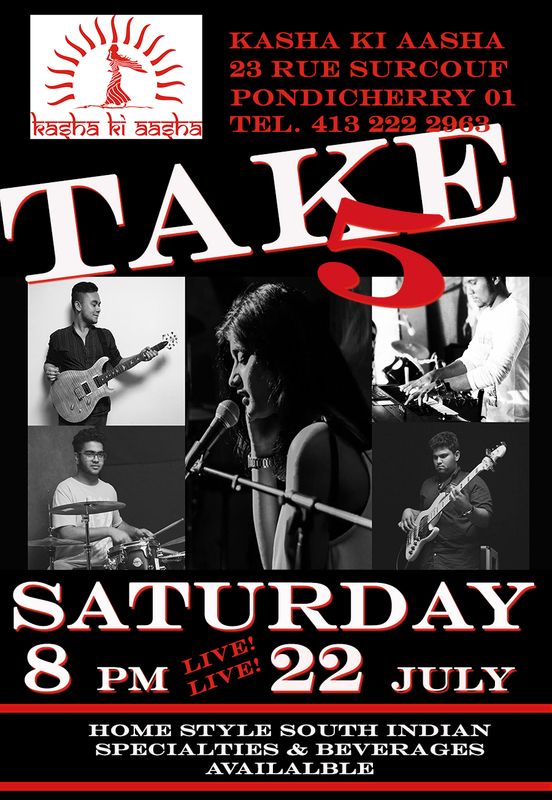 Kasha Ki Aasha’s music performances start at 8 pm. You can reserve a table before 7:45 by calling us at 413 222 2963 or just show up at 23 rue Surcouf, Pondy 01 when you are ready!